Summary : Here we will learn how to deal with a multi-physics system of PDEs on a complex geometry, with multiple meshes within one problem. We also learn how to manipulate the region indicator and see how smooth is the projection operator from one mesh to another. This equation expresses both incompressibility (\(\nabla\cdot u=0\)) and absence of vortex (\(\nabla\times u =0\)). One can also prescribe the normal velocity at an artificial boundary, and this translates into non constant Dirichlet data for \(\psi\). 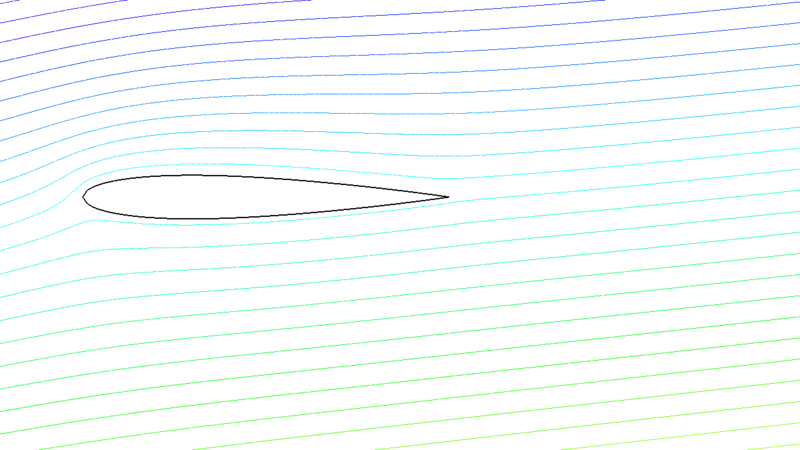 A zoom of the streamlines are shown on Fig. 15. Fig. 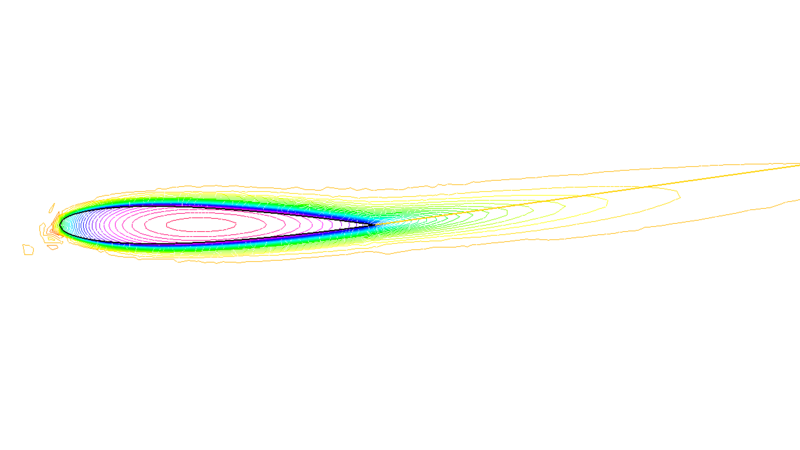 15 Zoom around the NACA0012 airfoil showing the streamlines (curve \(\psi=\) constant). To obtain such a plot use the interactive graphic command: “+” and p.
Fig. 16 Temperature distribution at time T=25 (now the maximum is at 90 instead of 120). Note that an incidence angle has been added here. But now the domain is outside AND inside \(S\) and \(\kappa\) takes a different value in air and in steel. Furthermore there is convection of heat by the flow, hence the term \(u\cdot\nabla v\) above. How the convection terms are added without upwinding. Upwinding is necessary when the Pecley number \(|u|L/\kappa\) is large (here is a typical length scale), The factor 10 in front of the convection terms is a quick way of multiplying the velocity by 10 (else it is too slow to see something). The solver is Gauss’ LU factorization and when init \(\neq 0\) the LU decomposition is reused so it is much faster after the first iteration.